The Rule Of St. Benedict espouses the virtues of obedience, moderation, and humility among its followers. 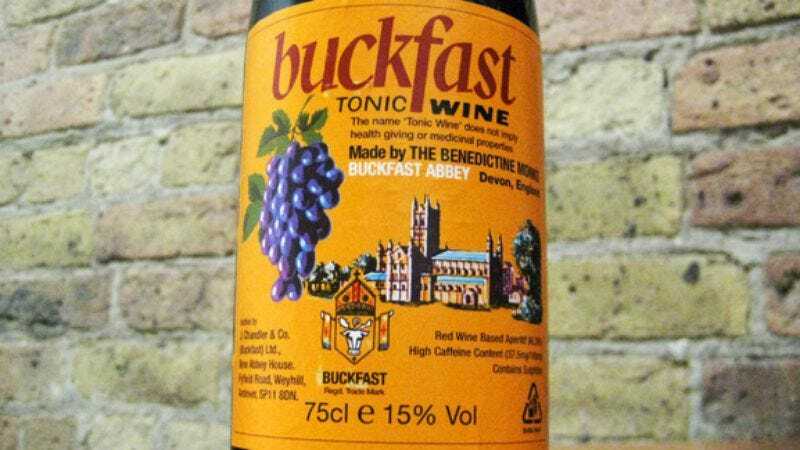 Buckfast Tonic Wine, originally produced by the Benedictine monks who follow these tenets, allegedly promotes civil disobedience, violence, and insolence among its imbibers. Hopefully the Benedictine monks of Buckfast Abbey—who haven’t distributed the wine since 1927, but are still credited with its production on the label—have as great an appreciation for irony as they do obedience. Buckfast has become so notorious in its native Great Britain—particularly Scotland, where it’s closely associated with the working-class “Ned” culture—that lawmakers are currently bandying about a bill that would restrict its sale. This is the second time Scotland has proposed such action against “Buckie” in the past five years, and is likely spurred by a recent BBC investigation that links Buckfast to violent crime. According to the BBC, Buckfast is mentioned in crime reports from the Strathclyde Police three times a day; one of those, on average, is a violent crime. The Buckfast bottle was also frequently used as a weapon in these crimes. Sound farfetched? Here’s a delightfully accented video from BBC Scotland about the Buckie scourge. Whether the relationship between Buckfast and violence is causal or just associative, its reputation—evidenced by colorful nicknames like “Wreck The Hoose Juice,” “Commotion Lotion,” and “Liquid Speed”—was more than enough to pique The A.V. Club’s curiosity. How could an innocuous bottle of red wine incite so much violence? Wine is supposed to make you sleepy and agreeable, right? Well, not when you pump it full of caffeine, it’s not! This is “fortified” wine, in this case bolstered by the equivalent of eight cans of soda in one 750-milliliter bottle. Combine that with its slightly higher alcohol content (15 percent ABV), and it’s conceivable that Buckfast could be a potent rage cocktail. Just as conceivable: Its sugary-sweet taste and low price point make it the ideal starter booze for young drinkers, who might be more prone to the hooliganism and “anti-social behavior” that Buckfast has been blamed for. Taste: You know how when opened red wine is left out in a warm area for a few days, it turns the brownish-red color of old blood? That’s the color of Buckfast fresh out of the bottle. Also contributing to its unappetizing appearance: a decidedly syrupy consistency, more on par with flat cola than wine. Put it this way: Usually we would feel a little trashy drinking wine out paper cups instead of proper glassware, but in this case, even pouring it into a sipping vessel, no matter how humble, seemed like overkill. Buckfast is clearly meant to be guzzled straight out of the bottle, preferably inside a paper bag so as not to offend with its ugly label and sludgy looks. Where to get it: If you’re in Britain, apparently you can’t get away from it. Here in the U.S., you’ll have to get more creative to get your hands on some rageahol: We put out a call via Twitter to help us obtain a bottle, and we were answered by a kind British reader/commenter named Andrew, a.k.a. Epiktistes. All hail Epiktistes!